Originally invented by a clinician, like our users, our therapy pools have been helping others achieve their personal goals since 1998. 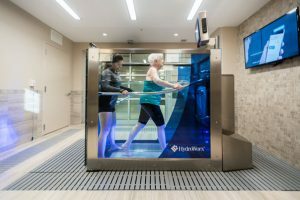 We believe in the importance of our underwater treadmill technology so much that it comes standard in all of our therapy products. As our history shows, our continued product innovation is guided by the best treating clinicians throughout the world. Pullman Regional Hospital chose to replace our pool with a HydroWorx because it is the gold standard in the pool industry. We wanted the safety of having stairs with a railing, a built-in treadmill and a pool large enough to accommodate several people at a time. 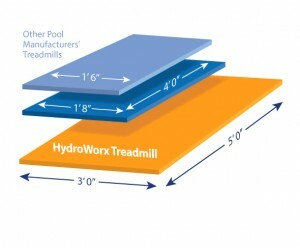 Since we work with a variety of patient types we needed a pool that can meet all those needs and HydroWorx is the one! Customer Peace of Mind: We know how significant integrating a therapy pool into your facility can be. That’s why we stay with you every step of the way. From poolroom design, marketing assistance and in-house customer service, we offer tools to ensure your program is successful. We are the only hydrotherapy company in the world to regionally service our products with our own highly qualified, regional technicians. Addressing Your Specific Needs: Whether you treat a patient population that has limitations getting in and out of a pool, you are concerned about budget, limited room space, increasing patient compliance and wellness participation— we have a solution for you and we want to help you meet your needs. Prior to the 2005 season, a HydroWorx 500i was installed in the training room. Frankly, it was better than we anticipated. I don’t think there is anything on the market that is better. I would enthusiastically recommend the company and the product to anyone looking for a therapy pool. With our HydroWorx pools, we have greater functionality than we had previously. Now we have the ability to rehab athletes even faster using the integrated treadmill along with the directional resistance jets. The versatility we can achieve with HydroWorx takes our athletic training to a new level. A few of our customers that have replaced their existing pool with HydroWorx. A few customers who chose HydroWorx for their new facility over another aquatic therapy pool they used previously.